Detroit was established as a French settlement three-quarters of a century before the founding of this nation. A remote outpost built to protect trapping interests, it grew as agriculture expanded on the new frontier. Its industry took a great leap forward with the completion of the Erie Canal, which opened up the Great Lakes to the East Coast. Surrounded by untapped natural resources, Detroit turned iron from the Mesabi Range into stoves and railcars, and eventually cars by the millions. This vibrant commercial hub attracted businessmen and labor organizers, European immigrants and African Americans from the rural South. At its mid-20th-century heyday, one in six American jobs were connected to the auto industry, its epicenter in Detroit. And then the bottom fell out. 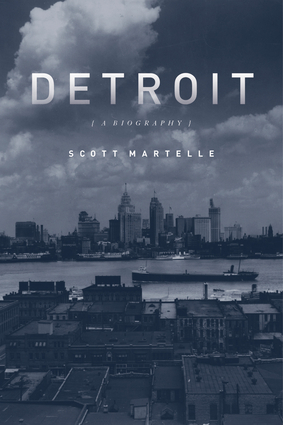 Detroit: A Biography takes a long, unflinching look at the evolution of one of America’s great cities, and one of the nation’s greatest urban failures. It tells how the city grew to become the heart of American industry and how its utter collapse—from 1.8 million residents in 1950 to 714,000 only six decades later—resulted from a confluence of public policies, private industry decisions, and deep, thick seams of racism. And it raises the question: when we look at modern-day Detroit, are we looking at the ghost of America’s industrial past or its future? Scott Martelle, the author of The Fear Within and Blood Passion, is a veteran journalist and former staff writer for the Los Angeles Times and the Detroit News, whose work has also appeared in the Washington Post, Sierra magazine, and other outlets.